Over the years Tuttle Contracting has been involved with almost every aspect of construction, both commercial and residential, even having a Colorado division that built high-end custom homes for many years. As each year goes by, we review and reflect what was successful, and what was not. After some time, we began to see consistency in roofing that not only was it financially successful but that we were considered roofing specialists by many with others turning to us for knowledge and assistance. Today we are more focused on what we are best at than we have ever been before; Roofing, Siding, & Gutters, with roofing being our largest division. Many customers don’t realize how much goes into a roof until after they have met with their Tuttle Representative, and that’s fine; it’s why you called us. But, it is important to understand a good roof is much more than just what you can see, it is a system requiring all of the parts to function together to create a waterproof covering for your home. See our page on Basic Roof Construction under Talk to a Pro for further explanation on the basic steps to properly putting a roof together. In this page we will discuss what most customers are concerned with; what surface covering to choose for replacement. Rest assured, no matter what surface covering you select we will design and build it with the proper system to ensure a waterproof covering over your home for years to come. What will the Insurance Company Allow? Once the insurance company has approved the claim for the replacement of the roof, they don’t care what material you choose all they care is that the roof is replaced. When following the Tuttle Method, the insurance company will allow appropriate funds, less your deductible, for a replacement material of “like kind and quality.” Simply stated, the insurance will provide enough money so your roof can be replaced to look just like it did before the storm, with your ONLY out of pocket expense being your deductible when using Tuttle Contracting. If you want to upgrade the material on your roof, now is a great time. But, that doesn’t mean the insurance company is going to fund the upgrade for you. Upgrading now allows you to select an upgrade and only have to pay the difference in cost from what you already have. Whether thinking of upgrading or just changing the color of your roof – technology allows you to see it before we build it. GAF Shingle Manufacturing provides the option to upload a picture of your home and alter the color combinations or simply change colors on preloaded houses that may be similar to your own. To use your own home, click on the link below for Virtual Home Remodeler, then on that page click on the tab at the top right that says “Use Your Own Home” and follow the on-screen instructions. Or, if you would rather choose a preloaded picture similar to your home, then follow the same link, but on the upper left click on the tab that says “House Type/Model” and after you have selected a picture click on the tab on the right that says “Roofing Options” and follow the on-screen instructions. Once you have narrowed down your choices, talk to your Tuttle Representative and they will bring actual samples by to see the real thing before you make a final decision. Asphalt Shingles: Every year manufacturers are making improvements in these products and today even the entry level products perform better than the premium products in years past. Today almost all asphalt shingles are referred to as a fiberglass composition shingle because they are made of more than just asphalt and have a reinforced fiberglass core. 3-Tab Shingles:This shingle is extremely common and is the least expensive choice. For years this was the standard in all roofing, but with an array of choices, today there isn’t one standard. 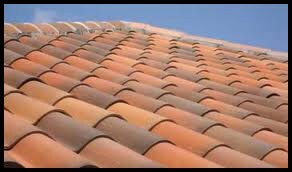 The name comes from its design; a solid piece of material that has two cuts in it to produce “three tabs.” This shingle is still a good option and will waterproof your home for many years, but it does not have some of the cosmetic advantages of other designs and it is more susceptible to high wind damage. Architectural Shingles (sometimes called Dimensional Shingles):Many homeowners are upgrading their roofs to this product as it is superior to the design and functionality of a 3-Tab Shingle, but does not have a large upgrade cost. Architectural Shingles are designed to simulate the 3-dimensional appearance of wood shakes and offer many more color choices than a 3-Tab Shingle. In design they are superior as well as they are constructed of one solid piece of material that is two layers thick, allowing the shingle to pass wind tests of over 130 mph. Heavy-Weight Designer Shingles: Within this category there are many different designs depending on the “look” you want to create for your home. Talk to your Tuttle Representative and they can bring books and samples out to help you decide which one will be best for your home. Other than design, the most noticeable difference in this product is the thickness and the weight. It is not uncommon for these products to weigh two and even three times as much as an Architectural Shingle. If you are considering this upgrade, allow extra time for the project to be completed and expect some delays. We will need to order an engineer’s report to verify the roof structure was constructed strong enough to hold the additional weight. In addition, these products are not usually stock items and will require more time for special order and delivery. Within these three design types advances in technology have also resulted in new “Impact Resistant” Shingles. To the eye, these products look the same but many of them are constructed of material other than asphalt; SBS Modified Rubber is one such material. If impact resistant shingles are something you would like to consider for your home, let your Tuttle Representative know and they will be happy to discuss your options with you. Wood Shingles and Shakes: With the increase of composition shingle options natural wood is less common than it once was, but it still makes for a very sound and beautiful roof. 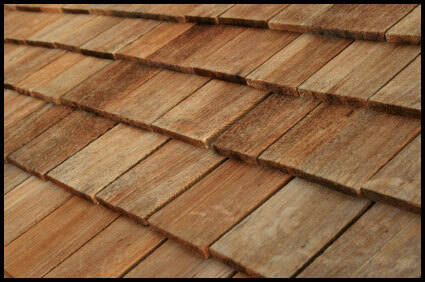 The shakes and shingles are made commonly made from cedar, redwood, southern pine and other woods. Originally these were all handmade, but today machine-sawn is much more common. A point to consider: Some local building codes limit the use of wood shingles and shakes because of concerns about fire resistance. Many wood shingles and shakes only have Class C fire ratings or no ratings at all. However, Class A fire ratings are available for certain wood shingle products that incorporate a factory-applied, fire-resistant treatment. Tile (Clay or Concrete): Tile roofing is considered a very durable roofing material, and will hold up to almost all severe weather conditions. If you have a tile roof already, it should still be checked after a severe weather event but it is likely there is no damage to the roof. Originally, this product was specific to Spanish and Mission Style architecture, but today a variety of shapes and styles are manufactured. Similar to Heavy-Weight Designer Shingles the roof must be engineered to hold the weight of this product, without the proper engineering this upgrade would not be possible. Slate: Unlike tile roofing, which is manufactured, slate is 100% natural, dug right out of the ground and cut to size. Within the United States it is commonly quarried in Vermont, New York, Pennsylvania and Virginia. Because it is 100% natural, the color and quality is dependent on the geographic location and the depth of the ground which it was dug from. Considered a 100 year product and virtually indestructible, it is, however, more expensive than other roofing materials. In addition, its application requires special skill and experience. Like other heavy weight products the roof must be properly engineered to hold the weight of the roof; tests must be performed before installation if this is considered as an upgrade. Metal: Metal roofing has probably seen the greatest increase in the variety of product availability. Originally it was thought of as a low-slope roofing material and more common in commercial and industrial construction. But today, standing seam, simulated aluminum shakes, stone coated steel and the like have been found to be a popular roofing alternative for steep-slope roofs. Metal roofing has many advantages and weighs much less than other premium products, but carries a significant cost premium. Synthetic Roofing: As with so many things, technology has resulted in a variety of other products being used to produce roof coverings. Materials such as: plastic, fiberglass, PVC, and rubber are some of the synthetic options available. Most of these are designed to simulate various traditional roof coverings, such as slate, wood shingles, and shakes. However, they do not necessarily have the same properties and many of them have not been available long enough to know how they will perform long-term. Will the insurance company offer a premium discount if you install an upgraded roof? If so, how much of a discount? And, what do you forfeit if you elect to take the discount?